As with any successful recipe, there are several key ingredients we use in creating our software here at Epignosis HQ: a passion for creating things; an understanding of the e-learning market and our customers needs; hard work and long hours; hard-core programming chops; ketchup (just kidding). There are also the technical ingredients, such as our use of development language. We use PHP for developing our products, and we are extremely satisfied with this choice. After all, and if we may say so, the results speak for themselves. In this behind-the-scenes post we’ll delve in why we opted for PHP, what benefits it gives to our team, and how those translate to a better product experience for our customers. PHP is available in all major hosting platforms, from lowly shared hosting plans to Heroku or the Microsoft Azure Cloud. It’s the exact opposite of a proprietary language that will lock you in to using a single vendor’s products. PHP is not a fad-of-the-month language, it’s a technology that’s been around for over 15 years. Facebook, arguably the biggest website in the world, uses PHP to connect BILLIONS of people. As does WordPress, the web publishing engine that powers an estimated 30% of the web. Lots of other hugely popular websites, such as Yahoo, do too. This means that your e-learning platform is based on a solid, proven, technology, that will still be around in 20 years. PHP was designed as a web language first and foremost. That makes it extremely easy to pickup and use to create websites with, which is the main reason behind its wide adoption. Simply put, you can get started creating websites with PHP in a matter of hours, and the language comes with a full assortment of libraries and APIs for nearly every web related task. This turn-key experience PHP offers makes it very easy for our users to extend our LMS products, either by coding a plugin themselves or by hiring someone who’ll do it for them among the (literally) millions of PHP programmers available. While other programming languages require specialized application servers, tedious deployments and beefy hardware, with PHP it’s enough to drop your program files in a directory in your hosting provider to have your dynamic website working. And if you do need to add all the extra layers (job queues, opcode caches, databases, third party authentication systems, etc), because your need to scale massively or interface with external systems, PHP supports those too. Hey, it works for Facebook, right? This means that we can design hosted and Cloud-based solutions for our LMS products that are as lean or as complex as our customers need, and deploy them quickly and easily — while it is also making it a smooth ride for those opting to self-host. There are thousands of PHP projects and tons of available code. Even if you don’t take programming yourself, you can usually find something for every need among the myriad open source projects on offer. We take advantage of some of those projects ourselves, by making use of some of the best libraries the PHP world has to offer to cut our development time and let our programmers work where it really matters: the e-learning engine itself. This is passed on to you, the customer, in the form of cost savings and new features arriving faster. There’s a lot of criticism of PHP in the web, and most of it comes from two camps: people who haven’t used it and people who have used it in its early years. For starters, modern PHP culture and tooling is not your grandpa’s PHP culture and tooling. Access to the best of breed frameworks and libraries like Laravel and Symphony, dependency manager apps like Composer, and unit-testing frameworks, ensures that modern PHP developers are on par with their Ruby, Python and Node using peers. Admittedly, PHP was a little rough around the edges in its early years, but since version 5.3 it has grown to be a quite competitive language, fixing past mistakes and adding modern programming features such as closures, traits and generators. All in all, we settled on PHP when we started working on our e-learning products portfolio, and it’s a choice we haven’t regretted in the least. If this article picqued your interest in the language and maybe even in extending eFrontPro, you might be interested in our recently released plugin guide. Happy hacking! The post e-Learning software made with passion and PHP appeared first on eFront Blog. You can change the videos dimensions through this page or by switching back to editor mode you can resize your file by dragging its edges. That’s it! Save your unit and you are ready to go. rel=0: in order to remove related videos from the end of the video I insert “&” then “rel=0″. 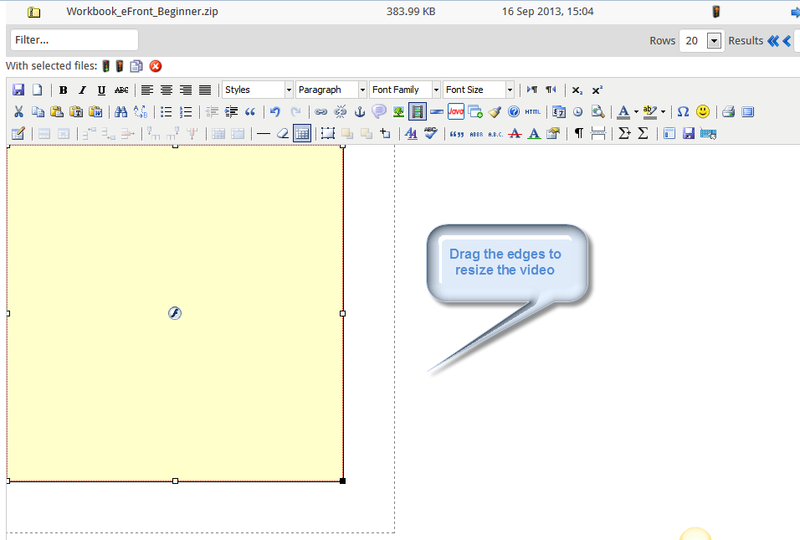 iv_load_policy=3 Setting to 3 will cause video annotation to not be shown by default. 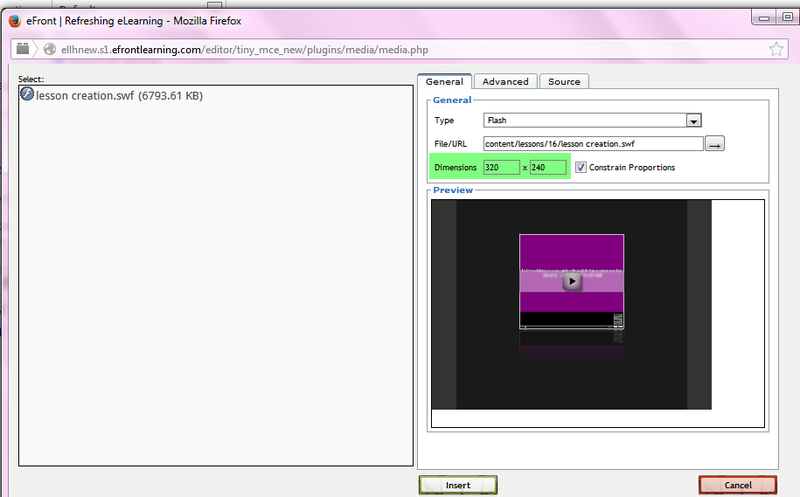 showsearch=0: Setting to 0 disables the search box from displaying when the video is minimized. Note that if the rel parameter is set to 0 then the search box will also be disabled, regardless of the value of showsearch. 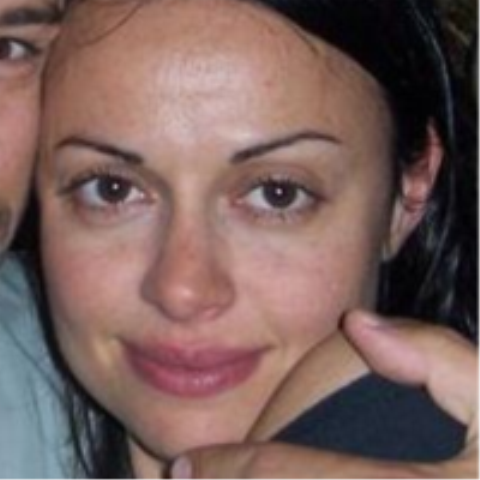 Eleftheria Papatheodorou is responsible for after sales support, customer training and beta testing at Epignosis (eFront). She holds a BSc in Management Science and Technology from Athens University of Economics and Business. She can be reached via Twitter @foyska or LinkedIn. Our Technical Director, Athanasios Papagelis, recently gave a talk to introduce Talent LMS – the ‘new, cloud based, lean LMS that emphasizes usability and easy course creation’. Please check out his presentation here! Many of our readers may not be familiar with Epignosis – the company behind eFront learning solutions. Epignosis has from the very beginning aimed to serve the small and medium enterprise as a learning technology provider and “democratizer” for elearning. How so? With eFront the vision was that every single business could have access to quality, affordable, easy-to-use, technology tools – and Epignosis has always been committed to producing value-for-money technology solutions for the small and medium enterprise. For more on our vision and where it stems from please check this post! Blog post: What is the Talent LMS? The product focuses on small organizations. There are a number of obstacles that prohibit small organizations from using elearning. To be productive, small businesses need a number of tools and several related services such as setup and maintenance, course creation and the support of end-users. All these require ample time, resources and money. It comes as no surprise that most small organizations find elearning a non-viable pursuit and prefer on-job or informal training methods. How can we provide real value to small organizations through elearning? TalentLMS is optimized around efficient time usage. Time is in short supply and time management is central to beating work overload and being more efficient. Efficient time usage is a solid base to support long-standing growth. We know that small companies have overworked people with multiple roles. We wanted to make their lives easier. Self-explanatory UI, fewer configurations, fewer steps to complete anything, increased retention, minimized risk. Forget creating courses from scratch. With TalentLMS you can create courses by transforming and reusing content from various sources to tell interesting stories with enhanced learning attributes. Reuse content from presentations, YouTube, Wikipedia, Slideshare, Scribd and many more sources. Create courses in a few minutes rather than a few days. Reuse material from your current presentations, word documents, videos or any online material from blogs to social sites. We transform the content to optimize the viewer experience. TalentLMS is based on conventions. A convention is a well defined default that works in most cases. Conventions mean fewer settings, fewer problems and increased productivity. Minimize time to be productive, improved user experience, increased productivity. TalentLMS lives on the cloud. Cloud is really about convenience. You can start or stop your learning portal immediately, you can grow as much as you like, you can minimize your costs and have a completely automated environment. In other words, a cloud solution lets you concentrate on results and not technology. Pay as you go, start/stop whenever you want, scale as needed, we handle all updated-upgrades-backup. Most tools offer different experiences between mobile and desktop interfaces. We don’t. TalentLMS is built from scratch to work with modern devices and is optimized around them. Lean does not mean simplistic or sub-optimal. We constantly debate and balance the pros and cons of an added functionality. We want to keep it really simple but at the same time powerful and adaptable. 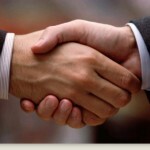 It feels good to have good partners, and certainly CLICK&LEARN is one of them. A company which was founded in 1998 and based in Linz, Austria, CLICK&LEARN is known within the EU for its innovative methods in implementing knowledge-based training programs and learning solutions with state-of-the-art technology. Recently eFront interviewed Roland Kaimberger, CLICK&LEARN’s General Manager, on how partnering with eFront has helped the organization with its business objectives. Roland Kaimberger: CLICK&LEARN specializes in designing and developing web-based training and eLearning solutions for staff development and knowledge sharing. Our web-based training and eLearning solutions are customized according to the needs of: international staff training, distributed groups of learners and/or experts, multilingual and/or multimedia based learning content, web based content sharing or knowledge exchange, blended training programs and distance education. Our clients include SMEs (Small and Medium-sized Enterprises) as well as large and public organizations. eFront: How did eFront address CLICK&LEARN’S business objectives? Roland Kaimberger: We were looking for a lean LMS with long term potential and we found that in eFront. Previously we used different LMS’ depending on our customer’s requirements. Now, with eFront, we can offer our customers one LMS which is customized according to their needs, is very usable and includes premium functionality like talent management. eFront: What were the most common project challenges when implementing eFront for customers and how were they overcome? Roland Kaimberger: eFront helped solve the most common project challenges for us for example, by simplifying multiple course mapping, offering flexible course scenarios and multi-tenancy capability. But most importantly, eFront offered enterprise features (such as branch management, skills management, jobs management, etc.) making it an affordable, high value and robust enterprise solution for our clients. 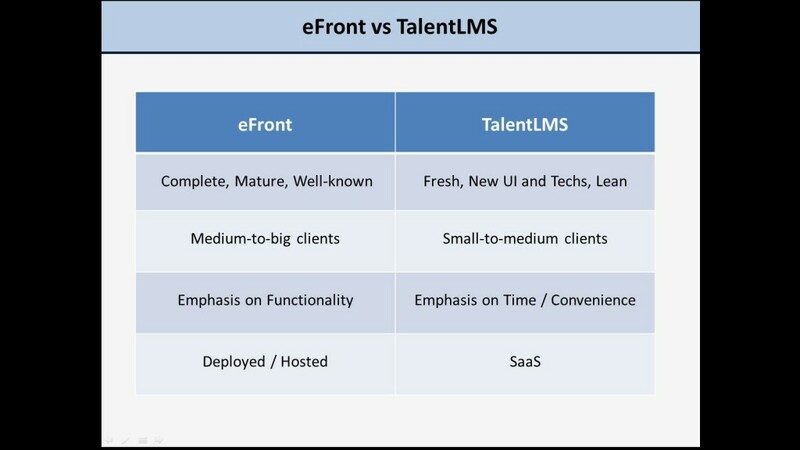 eFront: So why did CLICK&LEARN choose eFront over other LMS’ in the market? Roland Kaimberger: Primarily what was important to our organization was meeting our client’s needs for a reasonably priced solution that was suitable for medium enterprises. eFront offered everything we needed together with enterprise functionality and a lot of customization options – meaning that our client’s get everything they require in the one LMS. Also, eFront is SCORM certified, and is well known for its extensible architecture and wide range of modules that extends its functionality. 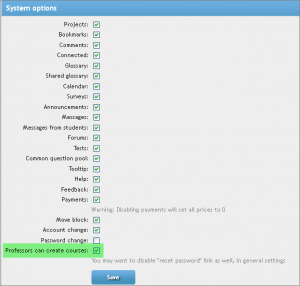 Lastly I would have to mention its excellent usability – it is a very intuitive software. eFront: So if you don’t mind us asking, which clients of yours are now using eFront? Roland Kaimberger: We have a number of high-profile organizations now using eFront’s LMS, the most prominent being EDUCATION GROUP, ENGEL Austria, Lenzing AG, MIBA, voestalpine, LENZING (LEADER FIBER INNOVATION), C+C Pfeiffer, Tips, Smurfit Kappa, Nettingsdorfer, Wirtschaftsverlag and u.v.m. eFront: What has been achieved through your involvement with eFront? Roland Kaimberger: We are very proud of the two gold medals we were awarded at LearnTec 2012, a leading international trade fair for learning technologies. One of those awards was the “provider of the year 2012” in the category ‘Learning Management System’ representing eFront, and the other was in the category ‘Customized Content Creation’. eFront: That’s great! Thank you so much for your time! For more on the LearnTec awards check this post. If you are interested in joining eFront’s partner/reseller network please visit http://www.efrontlearning.net/partners or contact us directly! What’s New in eFront LMS V3.6.11? With the new version, users have the flexibility to create a completely different customized environment for each branch – with a specified URL, theme (logos, colors) and language. Users are able to access a branch using the specific URL and administrators can define which users will be able to login using their particular branch’s URL. Conveniently, users that auto-register through a particular branch URL are automatically assigned to that branch. More information about this feature is available on eFront’s wiki page. Also new in branches is the ability to show courses/catalogue based on the initial login branch so that the course catalog is branch-specific. For more on branch editing visit this page. In eFront’s Enterprise version instructors have greater independence and administrators are freed up as they may be excluded from the lesson/course creating process. Instructors are now able to manage their own lessons and courses according to their needs. 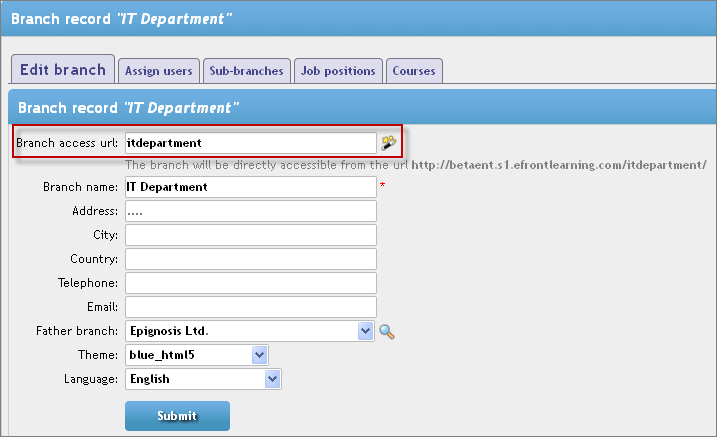 Note that new courses can only be assigned to the branch to which the instructor belongs. Also, with the update to certification (for more on certification, see below), instructors can now change the course completion date for a student manually – allowing instructors the flexibility to match changing needs. Users can now personalize their experience with the ability to add their own key rather than the automatically generated number. And with the latest update to certification users can also retake their courses without losing their certificates (courses can be reset before the certificate expiration date). Also with certificate extensions, instructors/administrators can easily customize by adding text to appear in the certificate as well as some predefined date variables related to the date that the certificate was issued. For more details on updates to eFront LMS V3.6.11 please check out this post in our forum. And if you are already an eFront customer you can download the latest eFront version here. Big announcements at eFront are coming in the next 8 weeks, so stay tuned! Firstly, we witnessed a strong movement towards cloud, lean and mobile solutions for eLearning. Cloud comes with several benefits for the client and allows one to offer a more integrated and smoother experience. The lean movement offers simpler, focused solutions that emphasize practicality over completeness. Secondly, as we were making progress on eFront-4 it became obvious that the core changes were of such a magnitude that it would be impossible to offer compatibility with the current eFront offering. A transition would have offered little benefit for current customers since they would have to start their implementation from scratch. So, we have shifted our eFront-4 effort to a cloud solution and we would like to announce a cloud-offering that will be part of the eFront LMS family by September 2012! This product will be implemented on top of eFront-4 architecture and launched under a new brand, namely Talent LMS. Talent LMS will be a true Software-as-a-Service product, based on a “lean” LMS approach and a preference for conventions over configuration. We will be happy to send you invitations to give it a try as soon as a public beta is out by the end of May (look out for news on our blog and Facebook page!) . Deciding to create an additional cloud-solution was not an easy one. However, we truly believe that it was the right one. We anticipate that, in due time, we will offer a deployed solution based on the eFront-4 core but this will take more time than initially planned. We would like to emphasize that eFront development will continue under the 3.6 version with an emphasis on ease-of-use,source-availability, completeness and the ability to have a deployed solution. Two years ago we introduced Community++ as a solution for very small businesses that wanted additional functionality on-top of the open-source edition. However, it’s clear now that this edition was not used the way we designed it to be used.At the same time it complicates our product mix by narrowing the gap between the open-source and commercial editions. So, we’ve decided to simplify our commercial offerings so that by the end of March 2012 Community++ will no longer be available. We will still offer software updates and support for our current clients until the end of this year. Furthermore, for all Community++ clients we will run a special50% discount in case they would like for to upgrade to an Educational or Enterprise eFront edition until 31/12/2012. Please get in touch with our sales team for more info! After several years in social media / communications for new technologies, with a focus on the elearning industry (and of course, after having been an avid reader of the eFront blog myself! 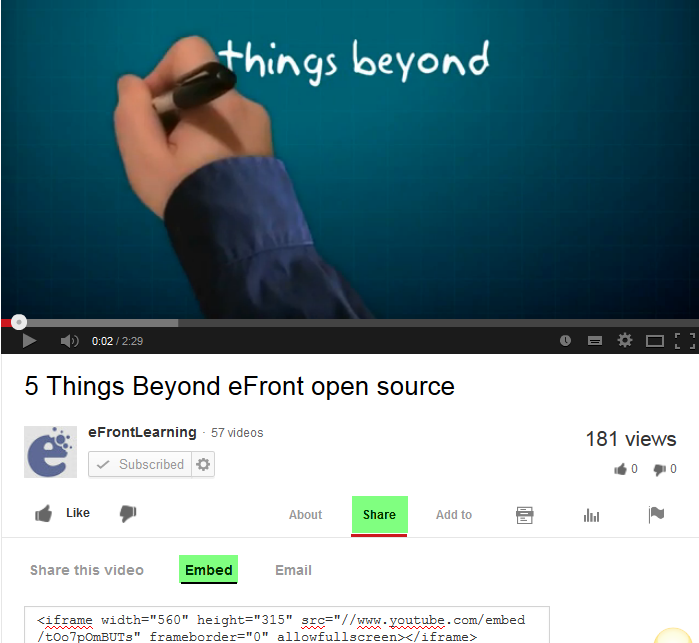 ), I have now joined the eFront team. And I’m excited to be part of the eFront community! I like blogging about social media, social learning, the future workplace, how culture affects learning, workplace collaboration,learning and talent management, innovation and disruptive technologies. I began my career in tertiary education, and then gravitated towards social media communications, blogging and community building. Over the years I’ve had the opportunity to work with many innovative products in the eLearning industry, but eFront always stood out with its flourishing online community (and reasons listed below!). ‘Coz we don’t believe busy people should spend their time learning how to use their platforms – eFront has an easy to use, intuitive user interface that will maximize the time spent learning new skills (not the platform!). ‘Coz we believe customers have the right to try before they buy. ‘Coz we believe our customers should have help whenever they need it. Getting clients reflects on a company’s sales team whilst retaining clients is a sign of a well-run company where team members across different departments must collaborate to create a rewarding customer experience. eFront‘s success is largely due to the fact that eFront clients always have someone on hand if something goes wrong, and eFront’s customer retention rate reflects that at around 95%. And if that’s not convincing enough, check out our customer testimonials for more! Roberta Gogos – you can find me on Twitter, or feel free to connect on LinkedIn!